Oh, the neighborly feud . . . When you aren’t able to pick your neighbors, it’s only natural that you should sometimes disagree, especially when it comes to the structure that divides your yards: the fence. So today, we’re discussing basic fence etiquette and tackling a few classic conundrums. For example, who should pay for a fence that benefits two properties? And what should you do if you despise your neighbor’s fence? I hope this lesson in fence etiquette will help you stay on good terms with your neighbors. So if you’re anticipating a fight or you’re in the middle of one, please scroll down to learn more about fence etiquette. P.S. If your dispute has escalated to a Hatfield and McCoy level, please call the authorities. Should I discuss my fencing project with my neighbor before installation begins? Yes, absolutely. The most important reason to do this is to ensure that your assumed property line matches the official property line. If you accidentally build on your neighbor’s property, you might have to tear the fence down later, so take your time and study your plat (a drawing that represents a survey) with your neighbor. If you don’t have a plat, you may need to hire a land surveyor to conduct a new survey (this will cost about $500-$1,000). To be safe, install your fence 1-2 feet inside the official boundary lines. However, fence etiquette does not require you to run your design plans by your neighbor. Unless your choice is dangerous or risks lowering their property’s value, you can choose whatever style you like. It is your property, after all. In addition, if you are part of a homeowners association (HOA), you will likely need to run your plans by the committee. They may have restrictions regarding the height, maintenance, and even the style of fences. Who should pay for a fence that benefits two properties? If you and your neighbor are on good terms and you both decide that you would like a fence to separate your properties, the cost should be split equally. A more common scenario is that one neighbor decides to build a fence and expects the other neighbor to chip in a little since one side of the fence will run along the neighbor’s property. In this case, the person building the fence should foot the whole bill unless the neighbor offers to help. Even if the fence benefits the neighbor in some way, they have no obligation to help pay for it. Note that in some cases, a neighbor will choose to chip in money so that they can have a say in the design of the fence. As long as both parties agree, this compromise might help you avoid neighborly tension. I want to be a kind, accommodating neighbor. What tips should I follow when constructing a new fence? Choose a classic design that matches your home and neighborhood. You and your neighbor will both be happy, and you’ll have a greater return on your investment. The unfinished or less attractive side of the fence should face inwards, and the more attractive side should face outwards. Of course, for many fences this won’t be a problem because the two sides are identical. 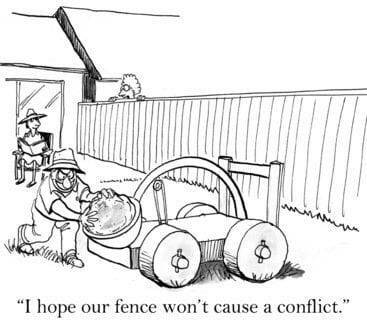 Take care of both sides of your fence. If you’re concerned about the maintenance, go with an easy-to-clean material like vinyl or aluminum instead of wood, which requires a lot of clean-up, staining, and sealing. My neighbor is harming my fence. What should I do? First, get evidence by taking photos of the damage. Then, bring up the issue with your neighbor and ask that they stop harming the fence and repair the previous damage. Ideally, you will be able to resolve the dispute at this level through honesty, civility, and politeness. However, if your neighbor refuses and the repairs cost more than $200, you can bring the case to a small claims court by filing a lawsuit. For more information, consult an attorney. My neighbor’s fence is hideously ugly or extremely neglected. What can I do? Unless the fence (1) violates local laws, (2) violates the HOA rules, (3) is dangerous, or (4) greatly impacts your home’s value, you will have to deal with it. Consider installing your own fence or planting hedges or trees to create a shield between your yard and that awful fence. A vinyl privacy fence will effectively obstruct your neighbor’s fence from view, for example. Or, if you aren’t afraid of a bold approach and you suspect that your neighbor also dislikes the fence, you could ask your neighbor if they’re interested in splitting the cost of a new fence (and tearing down the old one). Finally, if you’re looking for a new vinyl or aluminum fence, be sure to check out MMC Fencing & Railing. You and your neighbors shouldn’t have any trouble agreeing on one of our high-quality fences. If you’re interested in adding an aluminum fence to your yard, check out our Courtyard Aluminum Fence Systems. All of the rails and pickets are welded for strength, the fencing is lightweight and easy to install, and it comes with a lifetime limited warranty (30-year limited warranty for government, municipalities, and corporations). You’ll find basic residential styles, premium styles, and industrial fencing. Each fence is available in twelve standard colors—some solid, some textured, and some speckled. To learn more about our vinyl and aluminum fencing systems, please check out the MMC Fencing & Railing online store or give us a call at 1-866-931-5002. We would be happy to answer any questions you have about fence etiquette, and we can help you select a fencing system that fits your needs. Good luck!